Play video Marques fires Warrenpoint in front! from BBCMarques fires Warrenpoint in front! It's been a long day of Premiership action with big results impacting the top and bottom of the table. 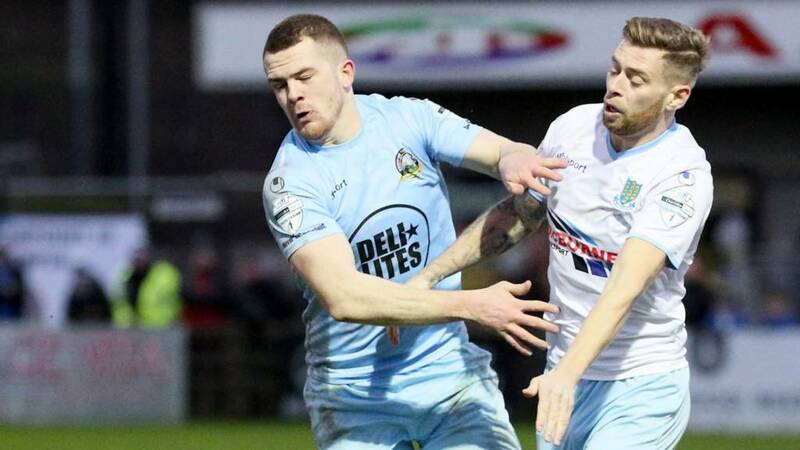 Ballymena's title hopes took a massive blow with a home defeat by Warrenpoint while at the bottom Ards secured a draw and basement boys Newry chalked up another defeat. Institute popped up with a late winner against neighbours Coleraine in our lunchtime opener. Thanks for joining us today and we'll be back next Saturday with both Irish Cup semi-finals. That miss from Carville condemns Newry to another defeat and they go into the split bottom of the pile and two points behind Ards. It's a third straight win for the fourth-placed Lurgan Blues with Andrew Mitchell heading in the winner with 14 minutes left. Massive late miss from Newry - Declan Carville has just Jonathan Tuffey to beat but the keeper makes the save. Glenavon break the deadlock on 76 minutes as Andrew Mitchell heads in from Stephen Murray's cross. Tiernan Rushe goes close for Newry but it remains goalless going into the last 20 minutes. Glenavon have dominated and created good openings but it's stalemate at the break. Glenavon finally get the ball in the net, courtesy of Eoin Wearan, but it's ruled out for offiside. It came after Andy Coleman made a crucial save to deny Conor McCloskey. Another Glenavon chance and this time Andy Hall hits it sweetly from long drive but the ball drifts just wide. Conor McCloskey then sees his deflected shot well saved by City stopper Andy Coleman. Glenavon go so close to an opener as striker Andrew Mitchell fizzes one in from a tight angle and keeper Andy Coleman appears to get a touch to divert the ball onto the crossbar. The visitors threaten again with Seamus Sharkey heading over from an Andrew Hall corner. Newry threaten first with a Stephen Teggart free-kick which flew just over the Glenavon woodwork. The visitors provide danger at the other end and City keeper Andy Coleman has twice made timely interventions to deny the Lurgan Blues. It was a strange game. I thought we played very well, missed a couple of gilt-edged chances at the start. Ards get a goal against the run of play and then get a second so we had to change one or two things around and fight for the game in the last 20 minutes. We got two goals and would have been up the road with three points but Sam [Johnston] made a fine save from David Cushley. I wasn't disappointed with the effort or the attitude, it was just one of those days when you have to say 'well done to Ards'. I thought their defenders played really well and their goalkeeper was outstanding. We would have won the game comfortably had we taken those earlier chances but it is what it is. The cup semi-final [vs Coleraine] is a massive game of football, we haven't won it ten years so we'll give it our best shot. The action has started at the Showgrounds. Football can teach you some very, very harsh lessons. Today was one of those days. The players in the first half basically took over where they left off vs Institute; superb football and a great goal. We should have made our dominance count. I said to the players that we have to capitalise when you're on top and while we started brightly, it turned into a bit of a huff and puff. We had a lot of possession but then were hit with the big sucker-punch. I've basically told them that football is a fabulous game, can give you some great highs, but can give you some lows and it gives you lessons. You have to take your opportunity. Warrenpoint are a great footballing side and I knew it was going to be tough. We've never really alluded to being in contention for the title. I've said it consistently all year that our target was the top-six and to have a crack at European football and that's what we're focusing on. That hasn't changed. We've had a lunchtime starter, the afternoon main meal and we await an evening desert. Newry are now two points adrift at the bottom after relegation rivals Ards secured a draw against Crusaders. So there's added pressure on Darren Mullen's team to get something out of this game going into the split. John Boyle comes in for Dale Montgomery in the only City change for the Showgrounds encounter. Fourth-placed Glenavon have won their last two league games and they also make one switch as Robert Garrett replaces Caolan Marron. Newry City: Coleman, Mooney, King, Boyle, McCann, Carville, McCabe, S Hughes, M Hughes, Rushe, Teggart. Glenavon: Tuffey, Daniels, Marshall, Mitchell, Hall, Harmon, McCloskey, Singleton, Garrett, Wearen, Sharkey. It's disappointing for Ballymena United but we have to worry about ourselves. For us, it's all about staying in this league and that's another big win towards achieving that. We're delighted that we've won and delighted that we came through injury-free, we've passed it with flying colours. That's the way we have to approach the end of the season; get as many points as possible and hopefully we'll overtake one or two teams. We lost five in a row there but we've shown signs of getting back to our old selves. We were excellent for 60 minutes against Crusaders during the week and our quality is coming back - we're really looking forward to the cup game next week. I'm disappointed but also very pleased. If you'd say a point against the champions you'd usually be over the moon. Look, they have so many quality players and they're very good at what they do. But I can't fault the players' effort since I've been in - they've been phenomenal, and I really mean that. They've been doing everything and they took today in their stride, and really enjoyed the game. I'm pleased with the performance but also disappointed that we couldn't win. Game over in the title race? Video caption: Marques fires Warrenpoint in front!Marques fires Warrenpoint in front! Quote Message: Ballymena just didn't move the ball quickly enough. They had plenty of possession but every time they took an extra touch they came up against a well set Warrenpoint defence. Fair play to Warrenpoint and their players will believe they deserved to win that game. Ballymena just didn't move the ball quickly enough. They had plenty of possession but every time they took an extra touch they came up against a well set Warrenpoint defence. Fair play to Warrenpoint and their players will believe they deserved to win that game.